The biggest holiday in Korea, the Lunar New Year, has just passed amidst the Winter Olympics in Pyeongchang. Along with traditions of family gatherings, hanbok dress, and ancestral rites, there are a few standard dishes that are staples of this holiday. If you’re looking to create your own little post-Seollal celebration that is truly authentic, you definitely don’t want to miss these staple dishes in your plans. There’s no question that Rice Cake Soup (떡만두국) is the main dish of Seollal celebrations. The tradition of this dish dates as far back as pre-Joseon dynasty, and has been kept alive since then. The dish also symbolizes becoming a year older, and sometimes when asking someone’s age the phrase “how many bowls of rice cake soup have you eaten?” will be used. In the early times of this dish, pheasant broth and meat were the main staples of the dish, but it has come to be replaced with chicken in modern times. Beef or anchovy broth can also be used as another option, and dumplings are often added to create a variation. A simple recipe to follow can be found here. Japchae (잡채), or Korean glass noodles, are a staple addition to any holiday celebration in Korea. These versatile noodles can be made as a main dish, side dish, or even just a snack, and are a great option for vegetarians (as the recipe works just as well with or without meat). As opposed to Western noodles that are often made of wheat and flower, japchae noodles are made from sweet potato starch. The noodles are boiled and then thrown into stir fry with a variety of vegetables and an optional cut of beef. A recipe for traditional japchae can be found here. Kalbi jjim (갈비찜) is, simply put, the Korean version of braised short ribs. Braised short ribs may be one of the most delicious meat dishes, and as such is often saved for holidays like Seollal. The meat is traditionally served with potatoes and carrots, with rice and kimchi as side dishes. This dish generally takes a bit longer to prepare in order to get the meat tenderized, but it’s sure to be a hit as the main course. Follow the simple recipe here. No holiday celebration is complete without the sweets! Traditional Korean desserts that are more popular are in liquid form, like Korean cinnamon punch and rice dessert drink known as shikhye (식혜). 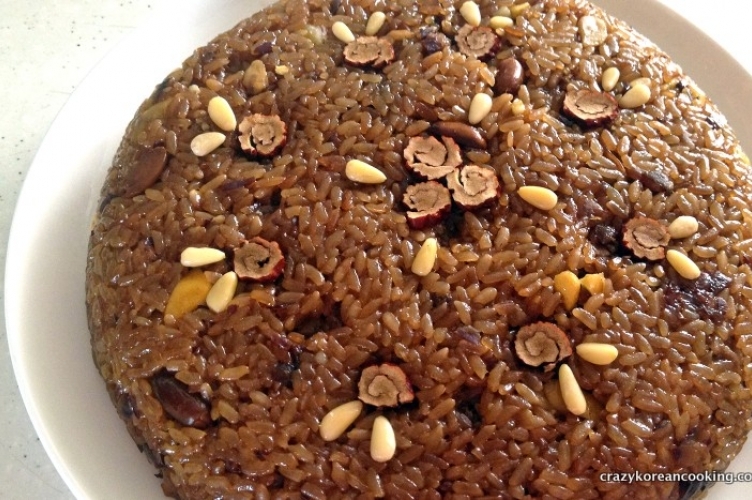 Another popular dessert is yaksik (약식), a dessert made of sweet rice, nuts, and jujubes. Yaksik has quite a long history, dating as far back as the Three Kingdoms period in Korea. The myth that goes along with it is that Silla’s King Soji was warned about a scheme of the queen trying to murder him by a letter delivered by a crow. Because of this, yaksik was offered to crows, and the king ordered the nation to observe the same ritual. Dec 9 Winter Holidays, Korean Style!